Ansell’s Sol-Knit® industrial glove provides heavy-duty mechanical and chemical protection for a wide variety of work environments. 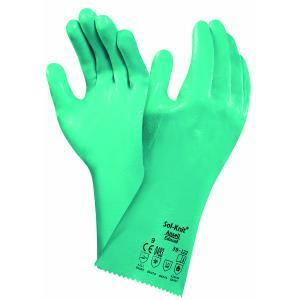 This very tough glove offers optimum comfort of use thanks to its natural shape that makes it well suited for use with long-lasting tasks. Superior dexterity and the high levels of wet and dry grip contribute to wearer safety and ultimately to the overall productivity. When you need a rugged glove with chemical protection, Sol-Knit® is the smart choice.